Our Leather-Leaf Deluxe garland is a slightly different variation than the Leather-Leaf Combo. It still has the dark green base of Leather-Leaf foliage, but has accents of both Variegated and Green Pittosporum, as well as Boxwood foliage throughout. 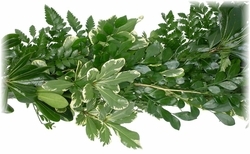 The variations of leaf textures and design, combined with the white edges of the of the Variegated Pittosporum really make this a beautiful addition to any wedding or event.